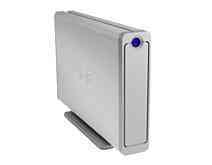 The most powerful Hi-Speed USB 2.0 hard drive in a portable 5.25" 1U form factor, LaCie LaCie Big Disk is designed for low-cost storage expansion and is ideal for backing up several workstations with enormous capacities up to 1TB. With USB universal connectivity and no software to configure, this plug & play drive delivers high performance with maximum convenience. Easily share and exchange among multiple workstations for archiving without clogging the network. Its durable d2 body has been uniquely designed to naturally dissipate heat (500GB and 600GB drives are fanless) and its “smart fan” technology (in the 1TB drive) allows for the quietest possible operation. Size: 173 x 44 x 272 mm / 6.7x1.7x10.6 in.